One of the lessons learned by children in school is that some things always add up. One plus one will always equal two; a square will always have four sides. So it is with the membership in the Holy Childhood Association: prayer and sacrifice will ALWAYS add up to faith in action. The students at St. Michael School in Hudson, MA have been learning this lesson well for generations, thanks to years of dedicated faculty and principals. As an alumna of St. Michael and the Director of Programs and Development for the Pontifical Mission Societies here in the Archdiocese of Boston, it has been my privilege to give back to the current students the lessons that I learned there through my involvement in the Mission programs. At the beginning of Lent, I traveled to Hudson once again to bring new Mission stories to the students. 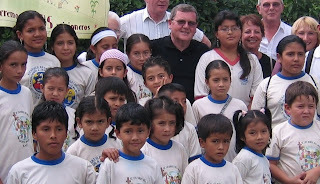 I told them of my trip to Ecuador where I met children who were also members of HCA. They live in the jungle area of Puyo, Ecuador; many walked for hours to reach the local Catholic radio station to attend a rally and celebrate their membership in HCA. They prayed, sang and danced, proudly wearing their HCA T-shirts. At the end of the celebration, they brought out a large basket and began to fill it with change. I watched as these children, some of whom were wearing their only set of clothing and were guaranteed only one meal that day, sacrificed what little they had. Why would they do that? The answer, to them, was simple. They knew there were children in the world who were poorer than they were because they did not know who Jesus was. These little ones in Ecuador wanted to give the gift of faith to others because, through HCA, they had learned it was the job of ALL baptized Christians to do so. After hearing this story, the students at St. Michael School told me, on camera, how they would make things add up in Hudson. They then raised $575 for the Missions during Lent! Prayer + Sacrifice = Faith in Action.